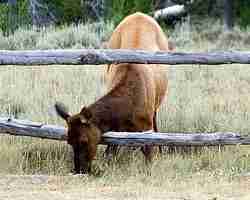 What Side of the Fence Are Ya’ Feedin’ From? Given you’ve visited a blog that aims to bring you freedom from the mood and anxiety disorders, I’m going to assume the later three. People eat. If we don’t, we die. Furthermore, if we don’t eat properly, we could well face the same fate. It’s simply the basics of – well – life (or lack thereof). But I’ll go ya’ one better. This dieing business goes beyond just the physical. Fact is, if we don’t sufficiently feed ourselves emotionally, mentally, and spiritually – death is a certainty, as well. Oh, it may not be the “no longer on this planet” kind. But tell me you haven’t felt “dead” – and verbalized it – in spite of the fact that your heartbeat and breathing were rockin’ with rhythm. So, then – if very poor feeding habits can kill you physically, why can’t they do so within the realm of the emotional, mental, and spiritual? We both know they can. And I believe that’s the dilemma of the mood and anxiety disorders. Curious thing here – I can’t think of too many depression, anxiety, and bipolar disorder sufferers who don’t have sufficient quantities of emotional, mental, and spiritual food on hand. No, the fridge and cupboards are full. The problem lies in availability and the selection process. With what exactly are you stuffing yourself? I’d like you to take on the challenge of an important exercise. And don’t bother participating if you’re not willing to open your mind and heart – with great honesty. Grab yourself a piece of paper and something to write with. Perhaps you’d prefer opening an electronic document. Chop! Chop! First thing I want you to do is write “My Emotional, Mental, and Spiritual Food” at the top. Now it’s on to composing two lists. And I want you to be thorough, so the work could take a couple of hours – or more. Let’s begin with the list that I’m willing to bet includes the bulk of your emotional, mental, and spiritual sustenance (that which leaves you feeling “weak, miserable, and hopeless”). Relentless depression, isolating anxiety, constant self-assault, no money, job or school dissatisfaction, loneliness, relationship troubles (and more?). Now to the other side of the fence (the one from which you’re likely not feeding). Jot-down each and every positive about you and your life situation. Okay, don’t even try to tell me you can’t come up with something! I assure you, there’s plenty. And if you’re having difficulty, ask someone close to you for input. High intelligence, wonderful creativity, compassion toward others, being a loving parent, amazing resilience, the fact that you even bother attempting a day, (ravishing good looks? ), and so much more. Oh, while I’m thinking about it – if you, indeed, have problems putting this particular list together, consider this. Maybe it’s because you’ve fed from the ick-list for so long that you’ve forgotten what something healthy and yummy tastes like. Once you’ve completed your lists, you now have the menu – an inventory of the fridge and cupboard from which you feed. As in the very sources of your emotional, mental, and spiritual nutrition. Tell me – how does it look? Know something? I deeply understand the question – and motivation for asking. Don’t forget, I endured decades of life-interrupting mood and anxiety woes. And I’ll tell you something else. Sure, I emerged from the woods a long time ago. But my genetics, coupled with my Bill-shaping environment, built a guy who will always have a mood and anxiety baseline that requires management. Yes, that means I can still make poor emotional, mental, and spiritual nutritional choices at the drop of a hat. But coming to grips with that – how my heart and mind work, as well as knowing how to stay on track – brings me a satisfying existence. You too? Exactly what side of the fence are ya’ feedin’ from? Would you like to chew on more chipur Feelin’ Better articles. Open the cupboard door.